Religion and marketing do not mix. I know I’m going to get some grief over this post, but here it is: Unless you are doing marketing for a church or other religious organization, my recommendation is that you keep the religion out of your marketing mix. And this includes your professional holiday wishes. 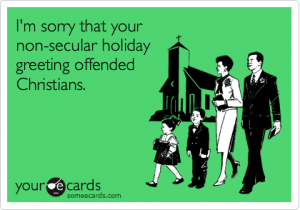 When you sign your messages with a “God Bless You” or “In His Name” or some such hint at religiosity; when you put an ichthus fish in the corner of your ad; when you send out a holiday card that emphasizes the Christian view of the holiday: there’s a good chance of turning someone off. I know, I know: the roughly 70% of folks out there who are Christians think Jesus is the reason for the season and all that. But when it comes to the marketing for your business, consider keeping your message to “Happy Holidays.” That way the Jewish, Muslim, Buddhist, Hindu, Atheist, and other people on your mailing list who are not Christians won’t feel inclined to hit “unsubscribe” or, worse: look for a different company to do business with. If you want to proclaim your faith: go for it! We are a melting pot of lots of things including faiths and we are all free to express that. Just go into it knowing that not everybody in your audience will agree with your sentiment, and some folks will feel uncomfortable about it.